Is an alfalfa futures contract in your future? The thought of alfalfa being traded on the futures market is a concept that probably scares a lot of hay growers and marketers. After all, supply, demand, quality, and good old-fashioned one-on-one negotiations have carried the day for a long time when it comes to hay pricing. Bill Plourd, president of California-based El Toro Export LLC, isn’t sure one is needed either, but he is on a U.S. Forage Export Council (USFEC) exploration committee charged to collect input from various stakeholders and fact find the feasibility of implementing an alfalfa futures contract. “This is the start of a conversation,” Plourd said at the 2016 National Hay Association Convention held in Pasco, Wash. Though the committee is comprised of forage exporters, Plourd emphasized the importance of getting input from all sectors of the industry. This includes producers, traders, buyers — both foreign and domestic, retailers, and end users. Plourd pointed out that we now operate in a global market with instantaneous information exchange. “What our Federal Reserve chairman says in Washington, D.C., impacts the price of hay in Ellensburg, Wash. The difference between using words such as ‘stable’ or ‘robust’ to describe our economy immediately moves the market,” he explained. Unlike annual crops, there are currently no good price projection tools for alfalfa when we have to look long term. The only means of managing risk is to take physical possession of the crop. Plourd said that we don’t really have a system of projecting alfalfa prices beyond a couple of months. Showing data that alfalfa is the fourth largest value crop in the United States, Plourd noted that alfalfa passes the volume test needed for establishing a futures contract. In addition to discussing the concept of a potential alfalfa futures contract with the various stakeholder groups, Plourd said the USFEC committee was also charged with contacting the Chicago Mercantile Exchange (CME) for the purpose of designing an actual contract. Once completed, it can be evaluated. There likely won’t be much movement on this effort until 2017. The current alfalfa market meets all of these criteria, though the concept of crop homogeneity, or being the same, might present the biggest challenge. Plourd surmised that a baseline quality would have to be established. He noted that a similar problem was overcome with cattle futures. “Still, it’s a bit of challenge with alfalfa compared to most other commodities,” he said. 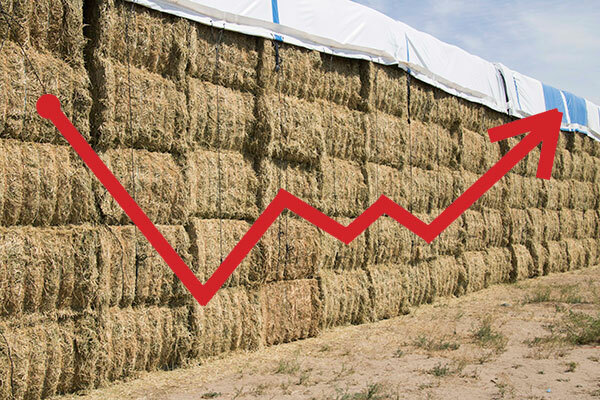 As for hay types other than alfalfa, Plourd noted that an alfalfa futures contract price could be used as a guide because most hay types follow similar price movement trends. Plourd also stated that a futures contract would enhance market transparency. Excessive speculation in futures markets is also a concern for some people. This type of activity has the potential to drive prices to values not reflective of the cash market. Plourd acknowledged the risk of this occurring but also noted that it is now easier for the exchanges to monitor such activity with our current electronic trading platforms. To conclude, Plourd noted that a futures market might make it easier for alfalfa to compete for acres against commodities that currently enjoy less pricing risk than hay. If you have an opinion on the viability of an alfalfa futures contract, feel free to leave a comment below or contact the USFEC.